Get your dream job with this online CV template. It looks both official and modern. That is exactly what you need from a powerful portfolio. A clean and minimal layout ensures that viewer's attention is captured by your content. The homepage features a full-screen slider and mega menu that is used for navigating to other content blocks. 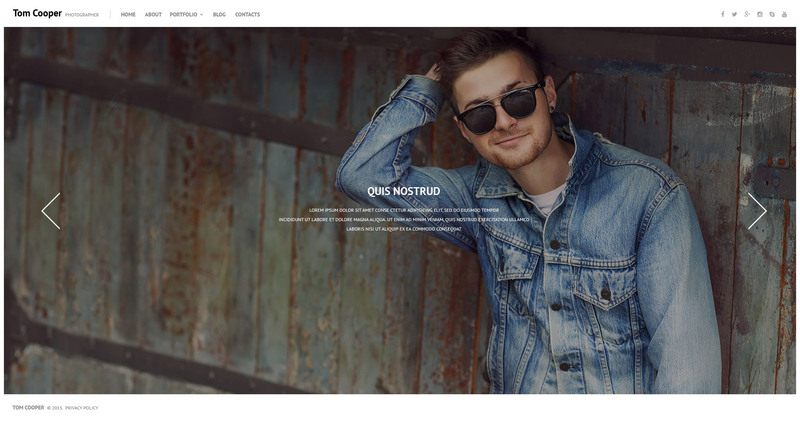 This photographer WordPress template is fully responsive, so more people will be able to view your website from handheld devices. WPML ready indicates that the template is suitable for the WordPress Multilingual Plugin. WPML-ready WordPress designs provide you with the flexibility to convert pages of content, tag words, categories, etcetera in a variety of various languages. This can make your web site content much easier to understand for worldwide consumers. A portfolio is a must-have tool of your business enterprise trying to create a competent brand. It is a display of project, products or services that can be organized in the visually fantastic manner. Portfolio is the most effective method to to get artistic using the information regarding you and your job and simply catch the attention of your future clients. It's a feature that helps to satisfy all customer and search engine requirements and obtain ranking positions in the search. The Search Engine Friendly web theme is without a doubt an excellent basic platform to start with advertising and improving search rates of the internet page. It's quite a bit easier to deal with this sort of internet page for Website seo expert basically because part of the work is previously done. Responsive design means that the webpage adjusts its shape and size to suit any specific screen, from the smallest cell phones to the widest Laptop or computer monitors. For every gadget, webpage components widen or scale down to look perfect. Parallax is a CSS animation effect that makes background elements shift slower than the front ones. It is one of the most sophisticated tendencies in the contemporary web design. Parallax scroll looks beautiful and attracts website users' sight to the illustrations and content modules. On-line Chat is an instrument that lets you have a live chat with your site visitors. Let clients request support team's guidance or get a hold of sales department while struggling to make a decision on the product. Your genuine assistance can transform viewers into loyal customers. Bootstrap helps you make responsive, mobile-first projects easily. Can I resell the customized WordPress template for Photography Business? No, you cannot resell the customized WordPress template for Photography Business as a template but you may sell it as a project to your client (see paragraph 1 ONE TIME USAGE LICENSE for more details). In what cases I don't need the extended license for WordPress themes for Photography? Will you help me to customize my WordPress template for Photography Magazine? We do not provide any help or instructions on WordPress template for Photography Magazine customization except for www.template-help.com help center. If you are not sure you can customize the template yourself we recommend to hire a design studio to customize the template for you. Is there any return policy for Photography WP themes? Requests for a refund are accepted at www.template-help.com/tickets within the period of 2 weeks after the order of WordPress template for Photography Portfolio is placed. You should accompany this request with detailed and grounded reasons why you apply for a refund. Please make sure your request does not contradict the terms and conditions specified in the policy. A refund is issued to you upon receipt of a Waiver of Copyright signed by you. I have customized the WP template for Photography Lessons and would like to protect my content by copyright, can I place Copyright, Mycompanyname.com? After WP template for Photography Lessons purchase you can put your copyright to the template. But you cannot place a line at the bottom (or any other spot) of the customized project saying "Website design by Company name". Nevertheless, you can place "Customized by Company name". Can I get the WordPress template for Photo Album Portfolio in higher resolution to use for printing? No, we design WordPress designs for Design Magazine optimized for web resolution only. Can I resell the Photo Courses WP theme as is? No, you cannot resell the Photo Courses WP theme as is. What is Extended License for Photography News WordPress theme? Will the WordPress template for Photography Business be deleted from TemplateMonster database? No, the WordPress template for Photography Business will not be deleted from TemplateMonster database. Is it possible to use your WordPress themes for Photography Services to develop websites for my customers? Yes. It is perfect for designers who want to offer their customers a high-quality design and also save time and money. Keep in mind that when you purchase the WordPress design theme for Professional Photographer with ordinary or exclusive license you're entitled to create only one project (one domain name). What is a one time usage license for a WordPress design for Art Photography? When you buy the WordPress design for Art Photography at usual price you automatically get the one time usage license. It enables you to use each individual product on a single website only, belonging to either you or your client. You have to purchase the same template again if you plan to use the same design in connection with another or other projects. When passing files to your client please delete the template files from your computer. I ordered a WP theme for Photography Video Tutorials but haven't received the download information. In case of not receiving the download information of a WP theme for Photography Video Tutorials, please contact our Billing Department via support chat by phone or e-mail. I would like to make payment for WordPress theme for Digital Photography Magazine by company check. Is that possible? Please use Skrill payment option. They accept payments by check.You can place an order for WordPress theme for Digital Photography Magazine on the site under the name of the company and choose Skrill merchant system for making payment from the company's account. To initiate bank transfer, please create an account here - www.skrill.com, add the number of your bank account and verify it. After that, you can place an order on our website and choose Skrill on checkout page. When the payment is made, the product will be sent to your e-mail along with the invoice under the name of your company. What am I allowed and not allowed to do with the WordPress designs for Photography Business? You may: Build a website using the WordPress design for Photography Portfolio in any way you like.You may not:Resell or redistribute templates (like we do).Claim intellectual or exclusive ownership to any of our products, modified or unmodified. All products are property of content providing companies and individuals.Make more than one project using the same template (you have to purchase the same template once more in order to make another project with the same design). I would like to purchase Photography Classes WP template, but it is not available on the site anymore. The Photography Classes WP template has been sold out for exclusive price or discontinued.As technology inevitably develops, TemplateMonster may discontinue the production of certain products. It can be no longer available for sale because of being outdated. Are your Photography Classes WP templatescompatible with any CMS? Can I put low resolution thumbnails of WP themes for Photography News on my website for my clients to choose designs? Is it possible that Template Monster will contact my client which website I made from Template Monster's website WP template for Pro Photographer? Yes, our legal department checks licenses regularly. In case we won't find designer's contact information on the site which was made from the WP template for Pro Photographer of ours we will contact the owner of the site directly. What is a buyout purchase license for WordPress template for Digital Photographer? If you purchase the product at a â€˜Buyout price' it guarantees that you are the last person to buy this template from us. It means that this WordPress template for Digital Photographer may have been sold before a couple of times (see â€˜Downloads' number in item's properties) but only you and people who bought the template before you will own it. After this kind of purchase the template is being permanently removed from our sales directory and is never available to other customers again. The buyout purchase license allows you to develop the unlimited number of projects based on this template, but the template should be customized differently for every project. Can I customize the Photography Courses WP theme? Yes, you can customize the Photography Courses WP theme to any extent needed. You cannot use a header of the template for one project though, and images from the template for the other project. Can I apply a discount code to a discounted WP template for Photography News Portal or combine several discount codes together to get better price? Can I customize the Photo School WP theme if that's required by application settings? Yes, you can customize the Photo School WP theme code, graphics, fonts to any extent needed. Our client was looking for a simple, yet classy design and this template fit the bill nicely. Very clean and classy across devices and easy to administer. It is a ready to use theme with Features that you do not find anywhere else so easily (built in MotoPress editor is a bonus, Advanced Theme Options, Sliced PSD, Back To Top Button, Calendar, Crossbrowser Compatibility, ...). Very good documentation. I just recently downloaded the Monstroid theme and started working on it. I like the control it gives the designer to change the color theme so easily. The built in MotoPress editor is a bonus. The variety of layouts is a time saver. The cons are the social media layouts are limited, wish there were more layouts.